The gendered impact agenda – how might more female academics’ research be submitted as REF impact case studies? As the impact agenda increases in importance, appropriate consideration should be given to its effects on female academics. The REF has obviously gendered implications, with a number of different factors combining to exacerbate existing inequalities in the academy. Emily Yarrow and Julie Davies have examined impact case study submissions to the REF2014 business and management studies unit of assessment and found women to be significantly underrepresented. There is clearly scope to foster further inclusion of women in the impact agenda through doctoral education, while institutions might also consider the creation of a new career path of “REF impact case fellows” who are rewarded for their focus on impact as a clear career track. As the weighting of the Research Excellence Framework’s (REF) impact component increases, so too does the notional importance of the impact of research on wider society. The increasing value attached to the impact agenda makes clear that it is here to stay. But what about its potential effects on female academics? The REF is a system which can be – and often is – gamed, and one which also has obviously gendered implications; for instance by contributing to increasingly individualised ways of working, and because of the insufficient account taken of time taken out of a REF cycle to evidence impact. We suggest that factors such as these continue to disproportionately affect women, and indeed are compounded by networks of male researchers, the predominance of male senior decision-makers for research in universities, and head hunters who still recruit more men to top positions than women. Our current research investigates what effects the impact agenda and the institutional requirement to produce impact case studies has on female academics. We specifically focus on diversity in relation to the research impact agenda through analysis of impact case study submissions to the Business and Management Studies unit of assessment of REF 2014. We explore how the impact agenda may help or hinder women management researchers’ scholarly impact outside the academy, as well as its potential effects on their careers. As the REF is a time-oriented mechanism, it exacerbates existing inequalities caused by maternity leave and caring responsibilities, which ultimately amount to time taken out of a REF cycle. The REF simply does not sufficiently consider the ongoing care responsibilities undertaken by “encumbered” faculty members, predominantly women. This, and the impact agenda specifically, ultimately further contribute to gender inequality in the UK academy – where the number of female professors is declining in a third of universities – because the time required to develop impacts is, just as with tasks such as conducting knowledge exchange activities and disseminating research, not adequately considered in formal workload models. In addition to the substantial time taken out of hours for travel and engagement, impact also requires considerable funding as an incentive for partnership working, and large teams. These are conditions women have historically been denied proportionate access to. This being the case, the impact agenda may actually set back gains achieved by diversity policies for women academics, adding yet another set of hurdles despite initiatives such as Athena SWAN. 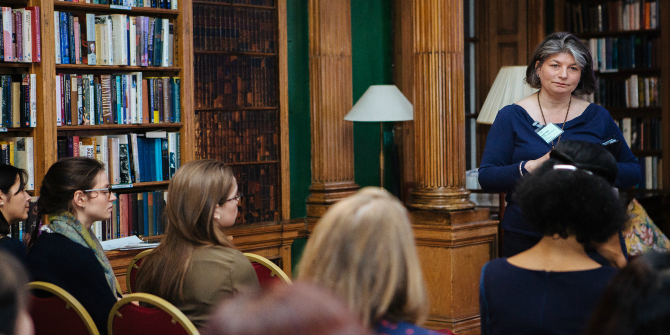 Image credit: Exe-X: Women and Leadership Reception 2015 by University of Exeter. This work is licensed under a CC BY 2.0 license. So, should we encourage women to be more involved in REF impact cases, particularly leading them? A resounding yes! Our findings so far reveal that, despite a wide range of topics and institutions being represented, only 30% of REF 2014 impact case studies submitted to the business and management studies UoA included at least one woman in the research team. Our interviews with REF impact case researchers suggest that time, resources, and workloads are not the only issues affecting representation; recognition, gendered communication styles, attitudes to self-promotion, types of impact cases, and motivation were all cited as key issues affecting women’s engagement in impact cases. While our interviewees felt these issues should be addressed, there was concern over the risks of reducing time allocated to writing academic journal articles and applying for research grants. Some academics would follow a research impact agenda without any government policy nudging us in this direction, however, others deliberately disengage from REF impact cases because of the time and effort involved. The question undoubtedly remains, though, as to whether women are wise to focus on journal publications and not become distracted by the time and effort needed to design and evidence impact? Or, in fact, do REF impact cases actually enable the production of academic journal articles by facilitating access to data? Whilst initiatives such as Athena SWAN are encouraging of and for female researchers, and the REF 2021 Equality and Diversity Advisory Panel (EDAP) suggests improved systems are in place to guard against discrimination, we assert that invisible, often unchallenged barriers – such as those outlined by our interviewees above – remain in place which militate against the equal contribution of women in academia and in research impact. Based on our research, it seems clear that perceptions of what constitutes positive impact upon society is socially constructed by those in powerful positions who design institutional principles to reward behaviours on the basis of so-called “meritocracy”. Policy and organisational designs based on merit, however, maintain existing (gendered) systems and cultures that advantage western white men. So, while male university researchers gain over the course of their careers from the “Matthew effect”, women are subjected to gendered systems and attitudes that undermine the contributions of women academics – what Margaret W. Rossiter calls the “Matilda effect”. It is also significant to note that both currently and in future the ability to produce artefacts such as impact case studies will become increasingly important in hiring and promotional criteria within British business schools and in countries like Australia and New Zealand, where the impact agenda is growing in importance. This has obvious consequences for academic careers. To conclude, there is clearly scope for the further inclusion of women in the impact agenda and in doctoral education, ensuring the positive societal impacts of research are not inherently gendered but have space for the constructive contribution of women scholars. It may be that the creation of a new career path of “REF impact case fellows” who are rewarded for their focus on impact as a clear career track (in the same way business schools recognise clinical professors) is one way forward for business school deans and university HR directors. Institutional and individual support – for example with funding for REF impact case design and implementation, remission from teaching, and input from journalists and REF impact consultants – can also help. We call for consideration of whether involvement in REF impact case studies enhances or hinders academic women’s careers in UK business schools, and of how we might encourage those who wish to engage in the impact agenda with appropriate support that boosts rather than detracts from their research outputs and promotion prospects. We would hope to see more women involved in impact cases and leading cases for business and management studies in REF 2021, provided this improves their career aspirations. Dr Emily Yarrow is a Teaching Fellow and Researcher at the University of Edinburgh Business School. Her research interests include human resource management with a focus on equality and diversity, organisational theory, inequality regimes, and cross-cultural management issues. To date her research has focused on the impact of research evaluation on female academic careers, women’s lived experiences in organisations, pensions, and the experiences of older workers. She tweets @Emilyyarrow1. More information about Emily’s work can be found at https://emilyyarrow.co.uk. Dr Julie Davies is HR Subject Group Leader at Huddersfield Business School. Her research interests include international business and management education, research impact cases, HRM in SMEs, professional ethics, and autoethnography. Julie is the UK lead for the five-country Erasmus+ project HRM in Regional SMEs and she co-directs the AAPBS business school deans’ programme. Julie has published in the Academy of Management Learning & Education and Management Learning. Julie tweets @JulieDaviesUK, and further information is available on her institutional profile.